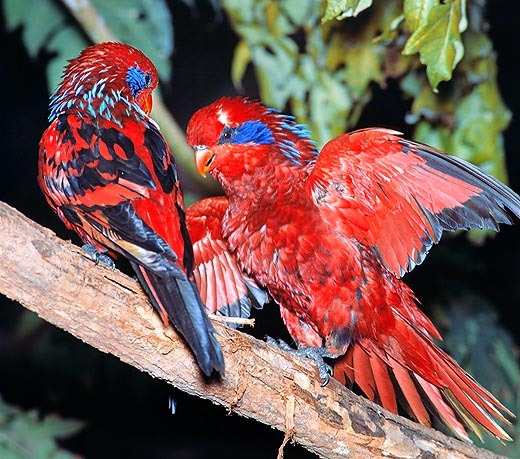 The genus Eos is found among the species of the family of the Psittacids (Psittacidae), subfamily of the Lories (Loriinae). It’s a group of birds having as predominant colour the red, autochthonous (endemic in the case of some species) to the islands of the Pacific Ocean, the so-called South Seas islands. As a matter of fact, they are settled in New Guinea (an island of the nearby Oceania, the largest, as extension, after Greenland), in the Papua New Guinea, and to Indonesia. 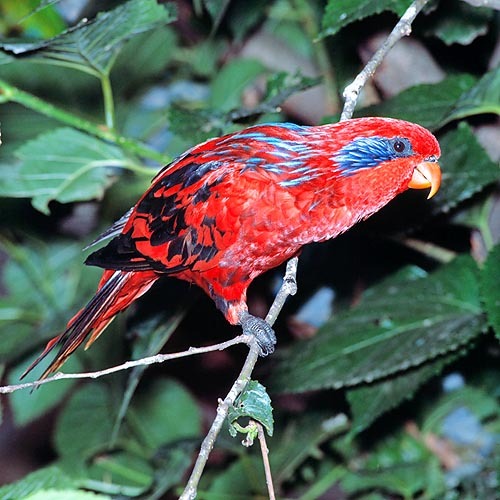 Amongst the typical species of this genus, we find the Red lory (Eos bornea), rightly, entirely red, with some rare blue and black dot on the wings and on the feathers of the rump, the Violet-necked lory (Eos squamata), coming from the western Papua islands, and the Streaked lory, called also Blue-streaked lory (Eos reticulata Müller, 1841), the rarest species we treat of in this text. The Eos reticulata is sedentary in the Tanimbar Islands (called also Timor Laut), in Indonesia, where, unluckily, the population is in serious, massive, decline due to the uninterrupted deforestation. And for this reason, the CITES forbids its trade and the IUCN has inserted it in the “red list of endangered species”. It loves the woody, or at least, bushy areas, where do grow plants with shrubby carriage which may reach the 3-4 m of height. In fact, they are birds with a mainly arboreal life, with a zygodactylous foot which renders difficult their walking on the soil, even if, at times, we may observe some individual walking on the same, for short distances, with a clumsy and dangling gait. Usually, the members of the genus Eos have a length varying from the 23 to the 31 cm; in the specific, the one of the Eos reticulata is of about 31 cm, per a weight of 150-185 gr. The general morphologic lines are equivalent to those of the other species of this same genus, with a predominance of cardinal red on the primary and secondary coverts of the whole body and of the wings. Furthermore, in the blue-streaked lory, as the common name avers, we notice feathers clearly streaked of blue on the neck, whilst they are fringed with black on the wings, especially towards the tip. The tail is longer than in all other species of the genus Eos, and is almost completely black. The sexual dimorphism, transitory as well as permanent, is absent. The beak is orange. Should it have a barren area at the base of the beak, it might be easily mistaken with a Lory of the genus Chalcopsitta. Indeed, it holds a common alimentary ecology along with the species of this genus. Like these ones, the Eos reticulata are in fact pollinivorous, nectarivorous and frugivorous, but, when captive, they may nourish also of soft corn (better if boiled before) in panicle, crumb of bread soaked in milk and mealworms, especially larvae of the genus Tribolium. Among all the species of the genus Eos, the one better reproducing also in captivity is the Violet-necked lory (Eos squamata), which is also the smallest one. The Eos reticulata has, on the contrary, a low reproduction rate, in the wild as well as in captivity. The female lays two eggs only, which she will hatch for about 24 days. The pullets remain for nine or more weeks in the nest, which is usually placed at the intersection and junction point of two branches with the trunk. The young individuals have a certain number of black feathers, which give the plumage a typical speckled pattern.